In the eight installment in the Realmgate Wars novel series we get to follow Thostos Bladestorm and Mykos Argellon as they lead their Warrior Chambers into Ghur to take and hold the Manticore Gate. Faced with brutal orruks and the savage bloodbound, the Lord-Celestants have their work cut out for them, but will Thostos be able to overcome the difficulties of his own reforging to claim the gate in Sigamr's name? Bladestorm, just like Call of Archaon and Black Rift before it, started out life as a serialized story, with each chapter released on its own. You can tell this right away since there are only eight chapters, and each one is fairly long. The story is somewhat short from what we have come to expect, but it by no means impacts my enjoyment of the book negatively. The whole thing flowed very well and I never got bored with what was going on. The only indication in the story flow that this was once serialized is the fact that each major battle is self contained to its own chapter. This is also the first novel from new author Matt Westbrook within AoS and he of course bring his own unique writing style to it which I will get to in a bit. The story opens with Thostos and Argellon dispatched to Ghur to reclaim the Manticore Gate from the forces of the Bloodbound. This is located in the Manticore Dreadhold of infamy, the one that the orruks keep tearing down and chaos keeps rebuilding. Thostos is cold and distant due to his reforging, something we saw already in Ghal Maraz, and it has Argellon worried. He is unsure if he can trust the other Lord-Celestant to make calm and calculated decisions. Right away they encounter a small band of humans fleeing from some pursuing orruks and rush to their defense. After rescuing them Argellon is determined to help them while Thostos sees them only as a liability. This really underpins their entire relationship, with Mykos Argellon still retaining much of his humanity while Thostos has lost most if not all of his. The humans we meet are led by Alzheer, an extremely competent tribal leader. She is actually probably my favorite character in the whole story. Her tribe is nearly extinct, having to constantly flee from the orruks. They all still worship Sigmar, in a way, and in fact, their culture is pretty interesting and fairly fleshed out for such a small part in the story. Interestingly they don't see the bloodbound as much of a threat, and in fact are somewhat happy that they are there since they distract the orruks away from them. Seeing the Stormcast try and interact with the mortals back at their camp is entertaining, with some having more success than others. The bloodbound launch a night attack on the camp looking for slaves to sacrifice in a ritual, but bite off more then they can chew when they run into the Stormcast. From here the Stormcast and tribal people's move on the attack to take the Dreadhold from the forces of chaos. What most people think would be the climax of the novel actually takes place about halfway through. I don't want to talk too much about what happens during this battle, since it will give away some key plot points, but it's pretty epic and a great read. Later the Stormcast must face off against the Ironjawz hordes outside the fortress, which ends in my favorite battle scene of the whole novel with Mykos Argellon taking on the whole horde 300 style. Again, it's really hard to talk about these scenes without ruining the book for you. Another favorite of mine, and probably the best part of the book to me, is when Alzheer and three Stormcast must venture into a series of cave networks to find and eliminate some vile Chaos scum who fled a previous battle. When there are only three Stormcast they don't seem as invincible as they do as a whole force. The fighting becomes much more visceral and brutal and we discover that they are a lot closer to human then we thought. Also, their deaths may not be as swift as we have been led to believe. This is important to me because it adds some gravitas to when they become injured or die, it's not just a reset button for them. This novel spends a lot of time dealing with the repercussions of death amongst the Stormcast actually, which is great, because I think it is the most interesting aspect of them. Clearly they don't die permanently in most cases, but it's not as clean and repercussion free as a quick glance may make you think. Unlike most novels this book really has about three or four separate climaxes, each as impressive and important as the last. This feels a little more realistic to me since in real life things don't tie off in a neat bow after one fight. The forces of order keep getting thrown back into the fight, each time more tired and depleted than before. 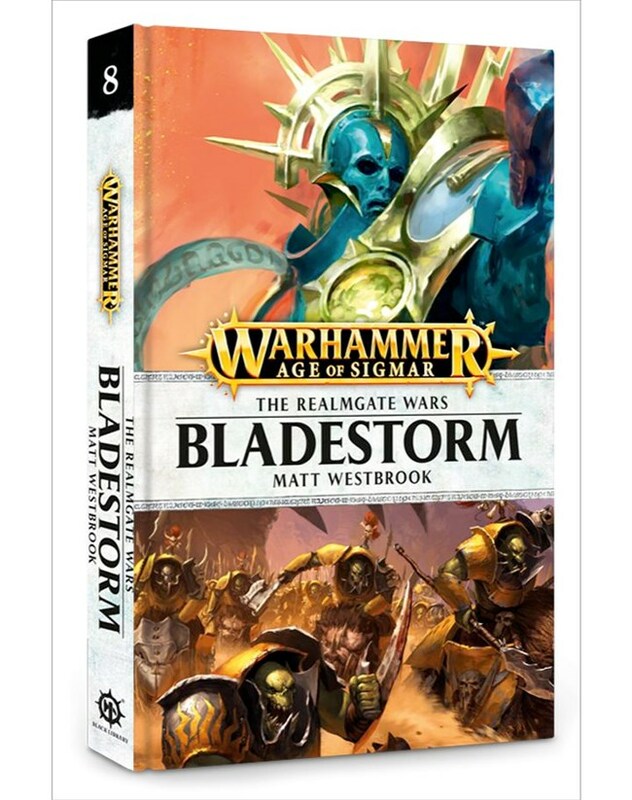 Matt Westbrook has a rather unique writing style when compared to the other Black Library authors. At first it almost seemed choppy to me since he jumps around from perspectives so much within a single chapter, but I soon got used to it and ended up really enjoying it. The "choppiness" gives it a fast paced feeling which keeps the story moving along, but sacrifices none of the depth of character or moment. Alzheer and Argellon are the standout characters in this, both feeling very complete and real. Thostos is great as well, but he is supposed to be somewhat robotic so at times he is not the most interesting to read. This is a great foil to Argellon though and he does have a bit of an arc throughout the story, coming to appreciate the mortals a bit more. The fighting is also super brutal and realistic. If some of the other AoS novels have felt grand and sweeping in their battles, like Lord of the Rings are something like that, Bladestorm is more closely related to the Jason Bourne series. Every blow feels real and when a Stormcast gets injured they don't just act like nothing happened, they are injured and you know it. This doesn't mean they don't keep dishing out the pain themselves, it just makes their actions even cooler. It's not that they don't feel the pain, the feel it alright, they just fight through it regardless. The fights in the cave tunnels and Argellon's fight against the orruks near the end particularly have this gritty feeling. I really enjoyed it and would definitely read another story by Matt in a heartbeat. He covered all of the important facets of AoS that make the novels interesting, the cost of death for Stormcast, the regular mortals still fighting for survival within the Realms, and the over the top awesome fight scenes. I would call this book a definite triumph and a great introduction of Matt Westbrook to the AoS scene, it's also a quick read. If you want something fast paced, gritty, realistic, and entirely engaging then I highly recommend picking this up. All of the characters' actions have consequences and all of those consequences have real weight and gravitas to them. It's tough and brutal, almost like a street fight, with great fantasy moments throughout, because don't get me wrong, there are still plenty of high fantasy moments in this too, they just feel grounded. 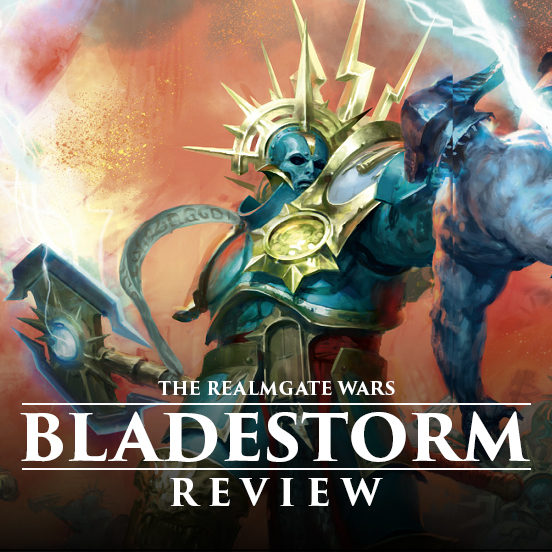 You don't really need to have read anything previously to be able to read Bladestorm, although War Storm and Ghal Maraz wouldn't hurt.